Lithograph produced in 1859, from a photograph taken in 1855. 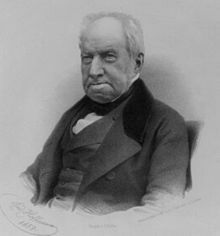 Robert Brown (1773-12-21 – 1858-06-10), Scottish botanist. Brown, R. 1811. On the Proteaceae of Jussieu. Transactions of the Linnean Society of London 10: 15–226. BHL Reference page. Brown, R. 1831. introduction to Scott Nind, I. Description of the Natives of King George's Sound (Swan River Colony) and adjoining Country, Journal of the Royal Geographical Society of London Vol 1ː17-21. Wikisource Reference page. For more multimedia, look at Robert Brown (botanist) on Wikimedia Commons. This page was last edited on 12 November 2018, at 14:19.